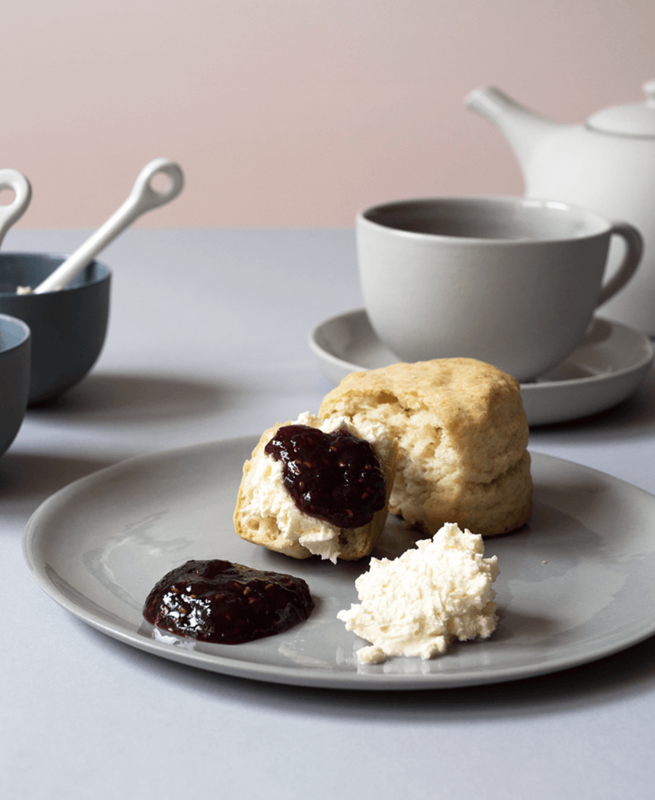 Is there a proper way to eat a scone at afternoon tea? Why yes, yes there is. Get etiquette rules and tips, including step-by-step instructions on how to eat a scone, the correct way. Like anything with afternoon tea, there are certain rules to follow to eating a scone correctly. I’ll give you the scone etiquette run-down. A scone is a small flour-based shortcake-like baked good. They’re usually plain, crumbly, dense, and lightly sweetened. The traditional English scones for with afternoon tea are round, not triangular, and they’re served with jam and clotted cream. Subscribe to get my FREE DOWNLOAD with tea etiquette tips! Thank you! Please check your email to confirm your subscription and to download 8 Common Afternoon Tea Etiquette Mistakes. If you’re at an afternoon or a cream tea service, on the table should be little serving containers filled with clotted cream, preserves/jams and lemon curd. These little pots are for the table, so no dipping your own knife into them, or even worse, dipping your scone directly into the container. Instead, use the spoons provided (usually sitting right next to the little bowls) to scoop out small portions onto your plate. Place the spoons back as they don’t belong on your plate. Try not to cross-contaminate and use a different spoon for each condiment. Feel free to go in for a second serving of jam and cream if you’ve finished what’s on your plate. You’ve now got your jam and clotted cream on your plate. Time to eat the scone. The best method is to break apart the scone into bite-sized pieces using your hands. I like to break it in half vertically then break that into half so you’re eating a quarter of the scone at a time. Is scone pronounced scon, rhyming with gone or is it scone, rhyming with own? It seems like both are used depending on where you’re from. In the US, we usually say scone, rhyming with own. Here is where the controversy comes in. Some people swear by jam first, then topped with cream (Cornish-style) and others, cream and then jam (Devon-style). I like cream first, then jam. A HUGE no-no is making a scone sandwich by putting the two halves together with the cream and jam in the middle. Don’t do it! Shudder. Scones are meant to be eaten with your fingers, not a fork. Actually, there really isn’t a use for a fork during the entire afternoon tea service. It’s strictly a knife and spoon affair. Scones are best when they’re served warm. Reheat them in your oven. At an afternoon tea, the scone course is the second course, after the tea sandwiches and before the sweets. 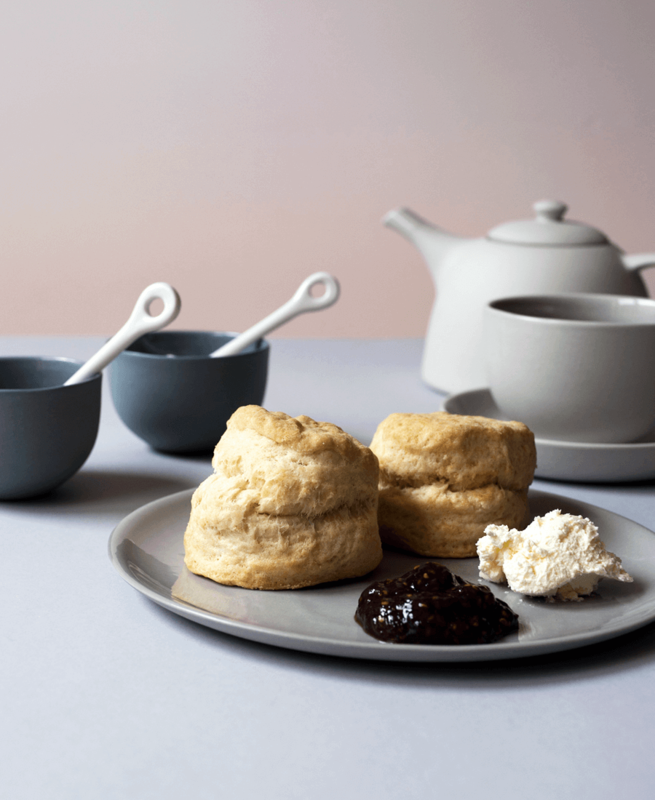 Traditional scones at afternoon teas are the round, not triangular. 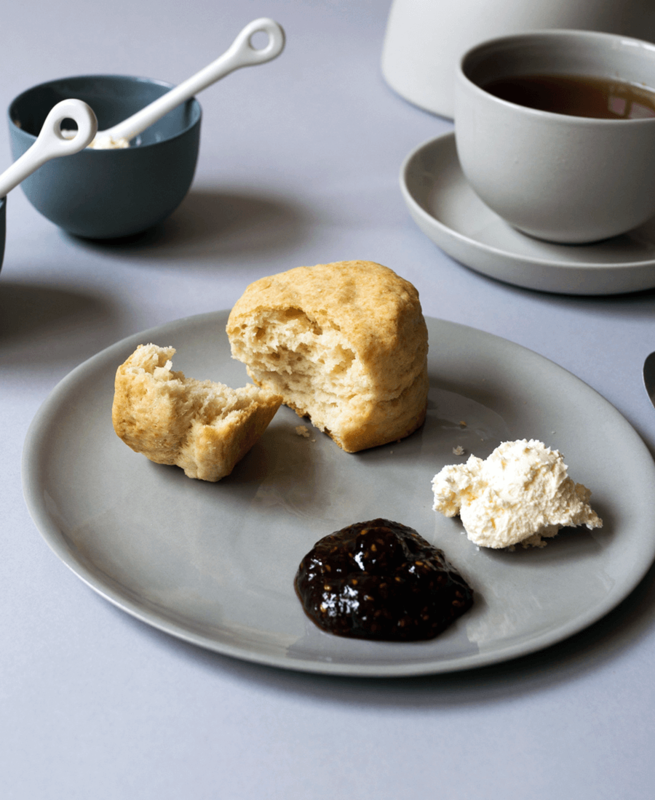 Scoop out clotted cream and jams onto your plate, enough for one scone. 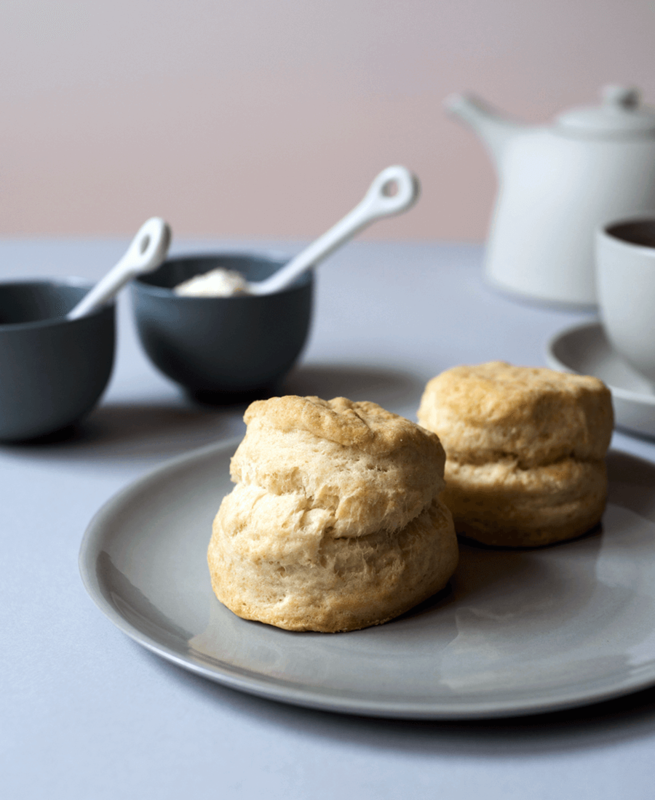 Break apart a small bite-sized portion of scone with your hands or if using a knife, cut the scone horizontally. Use a knife to slather on cream and jam onto the broken-off piece of scone. The bite-sized piece of scone should be eaten in 1-2 bites. Personally, I like cream then jam. Not only is it easier to spread on, it's aesthetically more appealing to me at least. Which makes sense since I never had Cornwall clotted cream as far as I know. During tea with British friends over the years I have noticed they prefer the Cornwall cream on top method. There's no official guidance on which goes on first, the cream or the jam. Rather, it's a very controversial topic depending on if you're speaking to someone from Devon or Cornwall. Having tried both methods of applying cream and jam to a scone, I'm more partial to the Devonshire method (cream, then jam) since it seems to be the more practical way for both cream and jam to stay on. If the jam goes on first, my cream usually ends up sliding off the jam and scone. Ling & Karen, thanks for the comments on this hot button topic! Who knew it was this controversial? Ling, thanks for the links, off to check them out! Never, ever cut a scone! It ruins the texture. Pull scone apart, spread each half with jam and top with cream. Eat open-faced. It is not a roll, do not break bits off. Yeah mate totally on this ting. Just then I was proper high and looking for some late night munch yeh. I look in the cupboard and boom, three of the four pack of scones I bought from the reduced section of sainsbobs yesterday (60p, bargain and a half). I had no idea whether these little things were toasted or not so I did a Google and got to here. The order of jam and clotted cream wasn’t a concern until I read this page. Unfortunately I don’t have any jam or clotted cream (and neither do my flatmates, I’ve already looked through their cupboards). Thankfully I had the trusty I Can’t Believe It’s Not Butter (or should I say I Can’t Believe It’s Not Clotted Cream And Jam) stepping up for the job like a hero. I wasn’t convinced by the ripping chunks off school of thought, it sounded a bit savage to me, so I cut it in half, spread the little devil with my low-fat marge and devoured my long anticipated take on eating a scone properly. Since learning about this – I eat one half with the cream & jam and the other half with the jam and cream. I still cannot work out which way tastes better. After all isn’t it the taste that matters?? Hi Nicolette, I think it’s all a matter of preference rather than taste since it should taste the same either way. I just prefer the cream first, then jam. It does not taste the same either way! Have you ever put Jam on toast and then put butter on top? The butter hits your tongue first giving a smooth creamy sensation, which is completely different. I just made my first scones…I know the horror! But, sorry to say I’m an American. I’ve yet to look up and learn to make clotted cream, Devon or Cornish. just took my scones out of the oven and tried a taste, no, I didn’t use a knife, I just broke it off. I think it would taste wonderful with a bit of butter. To stay true to scones I won’t do that. Off to make clotted cream. Say a prayer for this poor uneducated American regarding the ways of eating scones properly!! Hi Virginia, best of luck on your scone adventure! I found clotted cream at Whole Foods Grocery. Living out in the county in Wisconsin, no where near a Whole Foods, I have had to make do with a homemade version of clotted cream. I just use heavy whipping cream and whip the daylights out of it. No sugar or vanilla either. You want it nice and clumpy – stiff, almost to the point of butter. Then on it goes to a split scone followed by raspberry jam. I think I need to head to the kitchen now! In England it is regarded as quite vulgar to cut the scone, like cutting any bread with a knife at the table. You break the scone either in half through the middle or into bite-sized pieces. Any well-made scone will split in two fairly level. You should also never take the cream and jam and put them straight onto your scone. Using the jam spoon you should spoon some jam onto your plate. Using the cream spoon, spoon some cream onto your plate. Then using your own spoon spread either the cream then the jam – the Devon method, or the jam first – the Cornwall method. Which option you take here depends on your heritage and personal preference. Hi Katharine, thanks for your comment. I updated the post to mention just the method I prefer, which is to break the scone with my hands into bite-sized pieces. Hi Jade, haha, NO, I will NOT let the Queen settle it! If the jam is applied first, it is able to seep into the scone for added complexity. I happened upon your excellent diagram of the three tiered cake stand which I use for teaching about High Tea. 2. Scones are never cut, they are always broken open into halves, top and bottom. 3. As to the issue of cream or jam first. If using clotted cream, which is very thick, then it is the first layer and jam on top. If using the lighter, usually ‘whipped to thicken’ cream then the jam is the first layer and cream on top. 4. High Tea is a finger food event. A knife for spreading a spoon for transferring and a spoon for the tea. 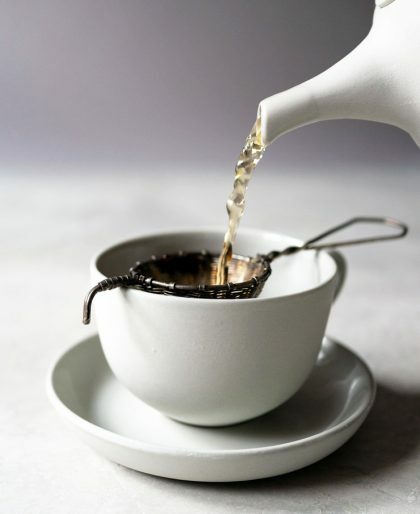 5 The definition I use with my students to help them focus on preparing an event is: “High Tea is the ‘luxury’ of small, high quality items, exquisitely presented, with a teapot and china cups. I put it in my mouth with cream, jam and more cream. And wash it all down with a nice cup of tea. Haha, Noor, that’s basically the best way to eat scones! Actually, “high tea” is often used incorrectly in this country – and it all has to do with the height of the table. Afternoon tea is usually served in the home around low tables in a living room while high tea refers to a meal served for supper around a high “sit at” table. The correct term for the low table tea is afternoon tea.